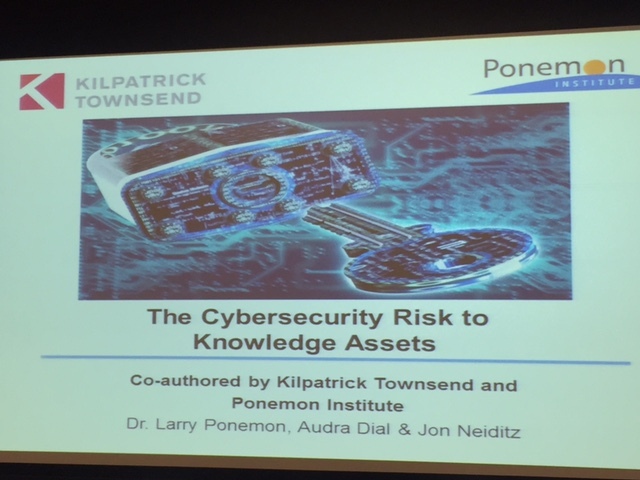 Dr. Larry Ponemon, Audra Dial, and Jon Neiditz discussed the Ponemon Institute’s annual survey that exposes the almost universal failure of organizations to protect "crown jewel" knowledge assets in a time of targeted cyber attacks. The study summarizes epic vulnerabilities, prioritization failures and communication gaps revealed by the survey. The event was hosted by Kilpatrick Townsend. We had a lively discussion of the FBI's role in investigating cyberthreats, and ways we and our clients can protect themselves against the latest forms of intrusions. (The resources and links provided are available here.) The event was hosted at Kilpatrick Townsend. Also, the section announced the election of our host Mike Breslin as Secretary of the section, with Paul Arne moving up to Chair and Fred Schuchman moving up to Vice-Chair, as of July 1.